This easy to make Barbeque Chicken Wings with a sticky sauce is perfect for the summer grill. Serve as a snack or as part of a meal. And this need not be deep-fried, so you do not have to worry about the oily bits. 1. Mix the tomato ketchup, vinegar, soy sauce, garam masala powder, curry powder and honey in a bowl. 2. Add the garlic, thyme, salt and pepper powder. 3. Add a drizzle of oil and mix well. 4. Pour this over the chicken wings and mix well until evenly coated. 5. Preheat an oven to 400F/200C. 6. Transfer the chicken pieces to a roasting pan and place it in the oven for 20 to 30 minutes. 7. Check if the chicken is cooked by inserting a knife. If the pieces are cooked, then there should not be any pinkness in the middle. 8. When the chicken is cooked and has a sticky coating, remove from the flame. 10. Serve as it is or as an accompaniment to a meal or with a salad. 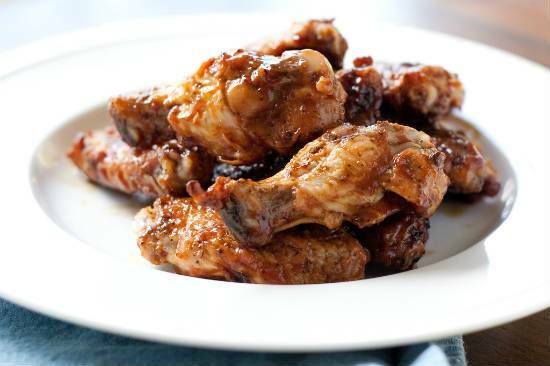 Feel free to comment or share your thoughts on this BBQ Chicken Wings Recipe from Awesome Cuisine.